Research Done properly, All-Flash Arrays are a lot more than just extra-fast storage: Reg readers told us in a recent survey that they can also be that rare thing, a transformational technology. Even if you have already invested in AFA technology and obtained good returns simply from the performance boost, there is almost certainly more that could be wrung from it, such as the opportunity to upskill and free up resources for more important tasks than routine admin. And the pressure to transform both business and IT has never been greater. Whether it’s phrased as “doing more with less” or “becoming more agile”, we know things cannot go on as they have done, not least because much of today’s process and technology is already reaching its limits. To take an obvious example, it’s not that long ago that we thought 100GB was a lot of data, so that’s what we planned for, but now we’re being asked to store and manage multiple petabytes, and of course to protect it all for regulatory compliance. This is where AFAs can play a major role – if you have the right kind of AFA technology of course, technology that can grow with and adapt to changing needs. 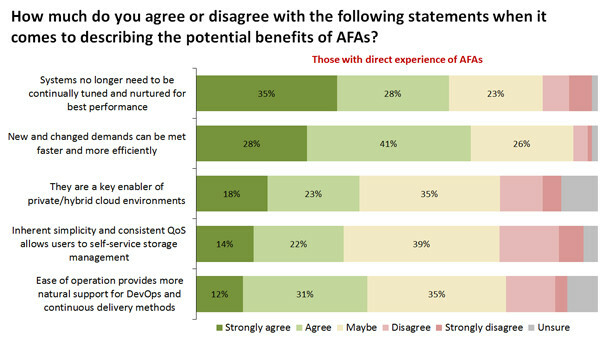 One of the insights gained from recent Reg reader surveys is a clearer view of how the AFA is evolving. In particular, where past analyses have identified two waves or phases of AFA usage and technology, in our latest survey we see a third wave is building up. Some enterprise IT teams were wary of flash to start with, having heard horror stories of how it could wear out quickly or even fail completely. But many were converted when SSDs achieved desktop success – and they realised just how much they could boost their most performance-hungry applications. Indeed, these early arrays used SSDs, plus firmware tweaked to allow for flash. This was high-priced stuff, so adoption was not widespread – hybrid arrays, with a tier of flash in front of spinning disks, were more economical for some users. But in businesses where every nanosecond counted, such as high-speed financial trading, the performance of an AFA was worth it. The next wave of adoption stopped pretending that flash was just a faster disk drive. Some still used SSDs, but now the array’s second-generation software was specifically written for flash, to open up the ways in which it differs drastically from disk, such as low latency and its read-write characteristics. The result was arrays that enabled businesses to do new things – to transform how they worked, how they ran IT and how they developed software. And thanks to the falling cost of flash, AFAs were more accessible than ever before. Hybrid arrays still sold in a few areas, for example to highly price-sensitive businesses or those who needed bulk disk, but AFA was “the new normal”. Although some of its features and opportunities were heralded in Wave 2, such as self-tuning and the ability to both scale-up and scale-out, we can now see a true third wave of adoption emerging from that. This is the phase that uses AFA as the storage foundation for the likes of private and hybrid clouds, for infrastructure-as-a-service (IaaS) platforms, and in the software-defined data centre (SDDC), for example. Of course, you should also take other measures such as storage consolidation, or automating routine admin. Those are short-term wins though, and while they can improve data centre efficiency they don’t really give your users anything different or better. For that you need a significant shift – which means you need business and IT transformation. This is where the second wave of AFA usage came in, and where Wave 3 will take things even further. Wave 3 is where we’ll see organisations achieving significant advances on the back of AFA capabilities such as storage automation, the ability to support multiple applications simultaneously, and more granular data reduction. These advanced capabilities either arrived with, or were greatly improved in, the second generation of AFA hardware and software, and they have been available for a little while now. It is time to put them to work. To find out more about the research, sponsored by Kaminario, download the full report, All-Flash Arrays: A catalyst for transformation. Analysis Back in the ring... so what are its chances?